Call or Text For a Free Quote Now! Jason started working with his father from a young age. He dug gas lines at $1 per foot for pool heaters, was a helper for service calls, and worked at the retail store for many years. His dad describes him perfectly as “much much smarter than I ever was”. He graduated from Penn Trafford High School and has a bachelor’s degree in business and psychology from Penn State University. 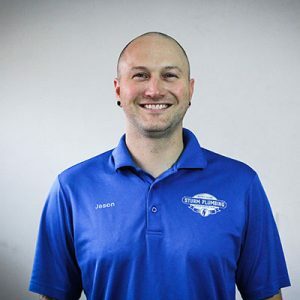 He is a certified installer and technician for Navien and Rinnai tankless water heaters and an ASSE-licensed backflow tester for the state of Pennsylvania. He is constantly reading, training, and learning to keep Sturm Plumbing at the forefront of an ever-changing field from Bluetooth leak detectors and trenchless water lines to Pex, trenchless water line installation, and more. Larry has been retired for a couple years but is still the first one at the shop every morning. 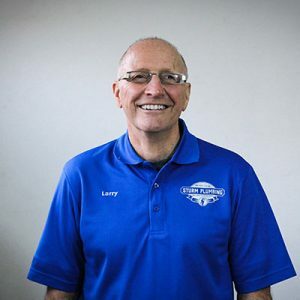 He is our in house plumbing advisor on any weird or complicated plumbing issues that come up because in 46 years, he’s just about seen it all! He enjoys organizing tools & materials at the shop and placing our weekly orders. See his full bio here. 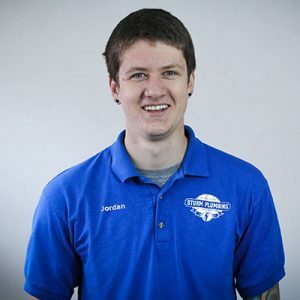 Jordan is a graduate of Penn Trafford High School in the plumbing Vo-Tech program. He has been with our plumbing company for many years of training. He started working with Larry around 11, just carrying tools and cleaning up job sites. We saw he had the desire to always learn more. He is not only mechanically inclined but a dedicated worker and a great problem solver. Customers regularly call in to compliment him. We are proud of this young man and are very blessed to have him on our team. Currently, he is enrolled in the master plumbing program and in his fourth year. For the last 12 years, Darlene has been the first voice you hear when contacting us. She does everything from scheduling and picking up materials to spreading topsoil and stone in the field when we’re shorthanded. 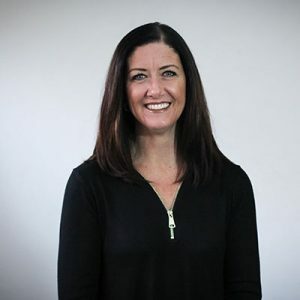 Although she’s not one of our plumbers she has an extensive knowledge of our products and services and can make many recommendations on the phone. Contact us if you need plumbing inspections, repairs, or installations at your home. We proudly serve customers throughout Murrysville, PA, and the surrounding area.